By Kerby Smith, photographer, printer, quilter, and BERNINA Ambassador. Visit him TheDigitalQuilt.com. Recently my wife, Lura Schwarz Smith, and I were teaching at Quilt Colorado 2014, sponsored by the Colorado Quilting Council. The director, Mary Rush, did a marvelous job of bringing teachers from a variety of different backgrounds to teach classes during the week-long conference and quilt show. The guest speaker for the Friday Night Banquet was Bill Kerr who, along with his wife Weeks Ringle, founders of the Modern Quilt Studio in 1999 at Oak Park, Illinois. We were fortunate to be seated at the same table as Bill during dinner and had a front row seat for his warm narrative about their journey as quilt makers. He pointed out that the quilts we call “traditional” were once “modern.” Whether you were a quilter from the 18th, 19th or 20th century, your designs were the results of the societal influences of the period you lived in, and they were “modern” at that time. The heart of their journey as quilters is influenced by their love of design. Both of them have advanced degrees in design and Bill currently is the Chairman of the Art Department at Dominican University in River Forest, IL. 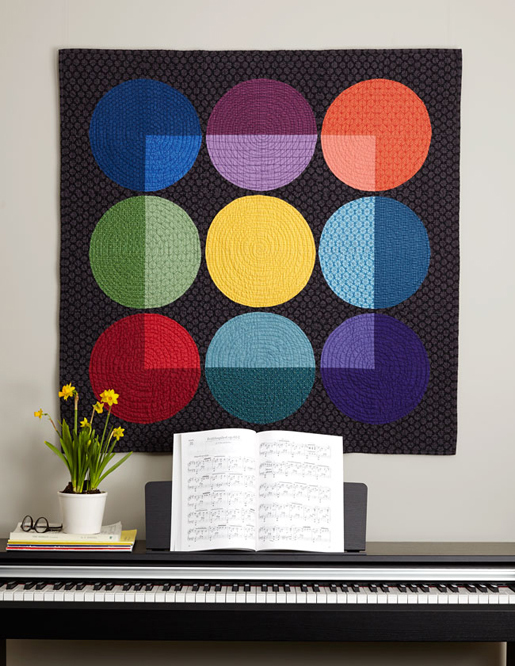 Big, bold, simple designs that often use solid colors have become the hallmark of their modern quilts. The first use of the term “modern” with “quilt” has been attributed to Bill and Weeks. Perhaps their book, The Modern Quilt Workshop, published in 2005 helped to cement their philosophy of design. The rise of modern quilting as a movement is a perfect example of the influences of our age of communication. The internet has become the party line of the world. And social media has become a virtual sewing bee for many people. The trading of ideas that occurred in the physical sewing groups of our ancestors is now extended in the online chat and blogs for today’s quilters. Like many revolutions that take hold of “modern” ideas, there is a rebellion against what is considered “old.” However, Bill’s message to the quilters at the Colorado conference was one of inclusion rather than division. He talked about the rich heritage that benefits all quilters, no matter what type of quilt you enjoy making. Designing quilts for Bill and Weeks is about process, whether they are making a “modern quilt” or a “traditional quilt.” And one of their most recent endeavors has been involving their daughter, Sophie, in making quilts. Last year, they helped her publish A Kid’s Guide to Sewing and the key message in that book is that sewing is FUN! It matters not whether you are eight or eighty, making quilts is a joy and before their studio was called the Modern Quilt Studio, it was Fun Quilts. Let’s take a look of some of their fun, modern quilts that have appeared in their magazine Modern Quilts Illustrated. 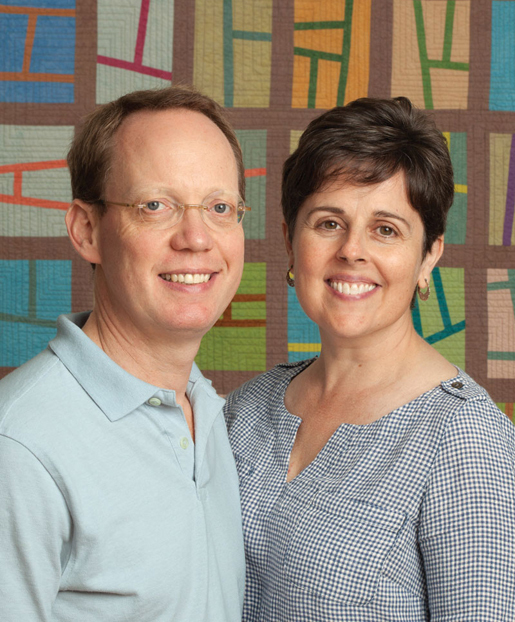 As educators, Weeks and Bill have been teaching their modern quilting philosophy and techniques since 2001. And by their own calculations they have taught over 10,000 students world-wide. So, it seems that it is natural they would use their designs to instruct quilters of all ages and styles how to improve their skills. One of the challenges they have seen among their students is the piecing of curves. Issue #8 of Modern Quilts Illustrated was dedicated to quilt designs that would allow you to master the technique. Two stunning quilts, Pacific and Jewel Box, use curved piecing. Pacific uses gentle curves, no notches and is straightforward to piece. But it is not a quilt to make during an all-night quilt-a-thon but rather one to savor while you explore the pleasure of the fabric palette in your stash. 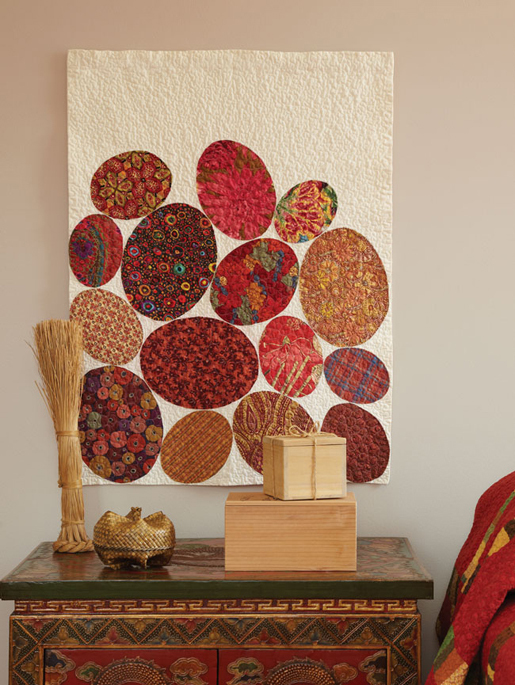 Jewel Box is a pattern that was inspired by the luminosity of Amish quilts, but of course Bill and Weeks gave it a modern twist. They used prints instead of traditional Amish solids. While this quilt uses quarter-circle pieces, it is really about the play of lights and darks to create the illusion of transparency. 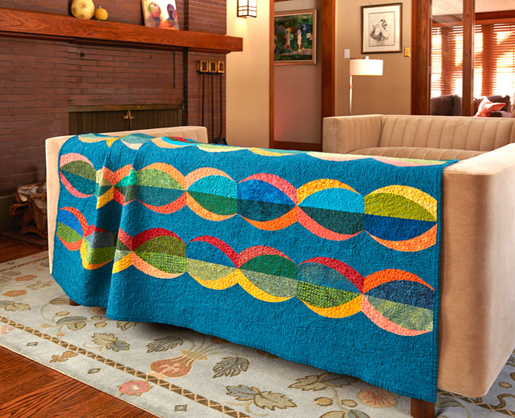 Just as the WeAllSew blog is about sharing the many ways we stitch, Bill Kerr’s presentation about modern quilts was about sharing the fun of quilting, no matter what type of quilt you make. All of the quilts shown are © Bill Kerr and Weeks Ringle of Modern Quilt Studio. The patterns for all of the quilts mentioned are available at www.ModernQuiltStudio.com.